Celebrate America’s amber waves of grain, as well as their finest amber ales. Each state on this hop-friendly map offers a spot to list your favorite local brewer, the date you tried it, and a flavor wheel to gauge your taste. 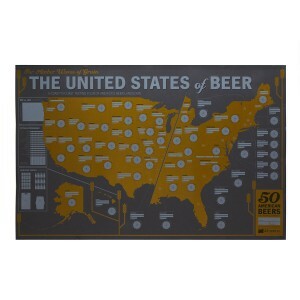 Whether you’re on a cross-country road trip or sampling some of America’s finest from the comfort of your couch, this beer-lover’s design allows you to sip from sea to shining sea and honor your favorite hops. Made in Portland, OR.